What is cortisol stress hormone? Altered production of this hormone protects us from stress, it can cause a number of serious conditions in the body. Cortisol hormone along with adrenaline, is produced in our adrenal glands, and was often called the "stress hormone", because its value in the body is always elevated in states where people "jumping out of their skin." One should know that one of its acute rising will not cause irreparable damage to the body, but over a longer period of time, associated with other hormones, and if there is a longer period of elevated cortisol, it would very much endanger human health. Read on to learn how to cope with this condition. Glucocorticoids including the stress hormone cortisol, are very important since they control the vital processes in our body. These steroid hormones affect the metabolism of glucose, fats and proteins, and adapt the organism to stressful situations. In everyday terms hormone cortisol reduces inflammation, regulates blood pressure, stimulates the immune (defence) system and runs the activity. In all stressful situations cortisol rises, but that would consequently be affected by the condition, must be associated a number of different factors. Medical studies have shown that elevated cortisol levels can be a trigger for numerous health problems, especially heart disease, chronic fatigue, obesity, depression, anxiety, mood swings and other mental disorders. Also, the stress hormone cortisol creates insulin resistance, which causes precipitation of kilograms, because sugar and carbohydrates from food do not burn properly, and are converted to fat - usually around the waist. Only a small percentage of people during the stress lose appetite, while most reach for snacks, sweet, fatty and unhealthy foods. Diseases caused by elevated cortisol levels usually occur in middle age. Read on to learn how to reduce cortisol hormone? Measurement of cortisol in the body is used to diagnose the disease and evaluate the functions of the adrenal gland, the pituitary gland and the hypothalamus. Determining the level of this hormone is important for the diagnosis of diseases accompanied by its overproduction (Cushing's syndrome) and hypo production (Addison's disease), and to monitor therapy in these conditions. The greatest value is in the morning and in evening the lowest (around midnight), which is why the level of this hormone is measured twice a day. Hypercortisolemia (increased output) illustrates the measurement of cortisol in the blood, or to measure the cortisol in urine (urine collected for 24 hours), and saliva. In order to obtain credible results, tests are carried out in hospitals in strict rest. The highest level-and the record is in about eight o'clock in the morning, when the cortisol hormone signals the body that it's time to get up out of bed, while during the day it gradually decreases, and the lowest is between 20 and 22 pm, when the body says it's time for sleep. Levels of the hormone should be in the context of the reference values: 171 to 536 nmol / L in the morning (7-10 h) and 64 to 340 nmol / L in the afternoon (about 18 hours difference). This rhythm of cortisol secretion can be affected by chronic stress, both physical and mental. This day-and-night rhythm is disrupted in all pathological conditions. The first step in treatment is the recognition of all symptoms. After a series of tests, it is possible with pharmacological agents to suppress cortisol. However, the treatment depends on the cause of the disorder, and it is necessary to do all the necessary diagnostic procedures which are very complicated and depend on a number of factors. In any case, if your cortisol hormone causes problems, you should contact the relevant doctor - an endocrinologist, who will start the tests in order to give appropriate treatment. In the event that you are diagnosed with tumour of the adrenal gland, then laparoscopic surgery is conducted. Due to the mutual removal of the gland prescribed is the replacement therapy and the dose is taken for life. If operation cannot be carried our different drugs are administered to reduce cortisol synthesis. Hormones in pregnancy and cortisol levels in pregnant women are much higher than usual, but the diagnosis at the time is quite difficult. If you are pregnant, most of the attention should be paid to your diet, and all symptoms that you notice, be sure to say to your gynaecologist, who will continue to focus. How to reduce cortisol with diet? Changing habits, healthy and balanced diet combined with a properly selected drugs - can influence the operation and the balance of our adrenal glands. As adjunctive therapy natural supplements that lower cortisol hormone and bring it into order can be used. These are products based on basil, golden root, magnolia, glutamine, vitamin C, folic acid and vitamin B5. 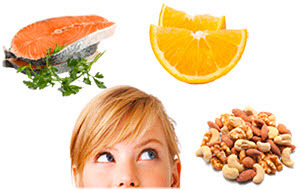 Also, nutritionists recommend foods which have a calming effect like legumes, whole grains, sunflower seeds and fish. It is suggested that a healthy diet is rich in fruits and vegetables, but also the consumption of foods with low glycaemic index, such as eggs, whole grains controls the production of the hormone cortisol in the body. Since stress stimulates the secretion of hormones, you need to know that hunger or overeating has the same effect, which can be a trigger for the increased secretion. Therefore, you should not skip meals, but eat a small amount of food at regular intervals during the day. Stress is difficult to eliminate, but its negative effects can be diminished by a daily walk, rest, meditation or yoga, moderate exercise, regular sleep cycle 7:00 to 9:00 hours at night.